Amazing Stone | Bay Area granite & quartz countertop specialist - Amazing Stone, Inc.
As a granite and quartz installer, countertop is naturally our core business. There are many choices out there in the market, homeowners have to do their own share of research before making a decision. Granite, marble, quartzite, and travertine are all considered natural stone, but granite is the most common due to its toughness and relatively stronger stain resistance ability. However, granite is still a natural stone, which is porous. That's why it needs to be sealed. On the other hand, quartz is a manufacture material, which is non-porous, and it can offer the same toughness as granite. Base on research from consumer report, the only practical different between the two is the chore of sealing the material, which is where our 25 year sealer comes in handy. With Stain-Proof Plus by Dry-Treat, it seals the natural stone against stains and it lasts for 25 years. Now the two materials are evenly match. Besides the stain resistance, the other difference is the visual effect. Granite in general has a lot of patterns, while quartz is popular for its marble mimic patterns and solid color options. 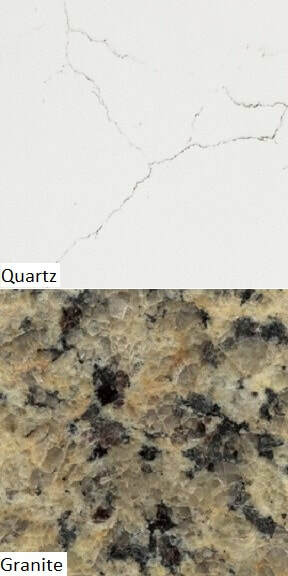 Granite or quartz can work out in many different designs, which depends on the homeowner's taste and choice. Natural stones come from mountains all over the world. After taken out of quarries by blocks, they go to different factories to be sliced, gauged, and polished before they can be sold to the general public, which become raw slabs. When a fabricator work on a countertop job, the most time consuming process is to create the edge. Pre-fabricated countertops take it one step further from raw slabs. They are being cut to size and pre-edged before selling them to the general public, so it cut down the actual installation time dramatically. Pre-fabricated material may be the way to go for some clients, but it has its limitation such as size, quality control, and color matching. At Amazing Stone, we direct import our own pre-fabricated material. Since we pick our own block and factory, we can make sure the factory uses a better machinery on our material to generate better countertop with uniform thickness among each pieces. We only purchase granite that sliced from the same block, which ensure color matching. Since stone are natural, not every piece will match perfectly, but at least we've done our part to make them as close of a match as possible. 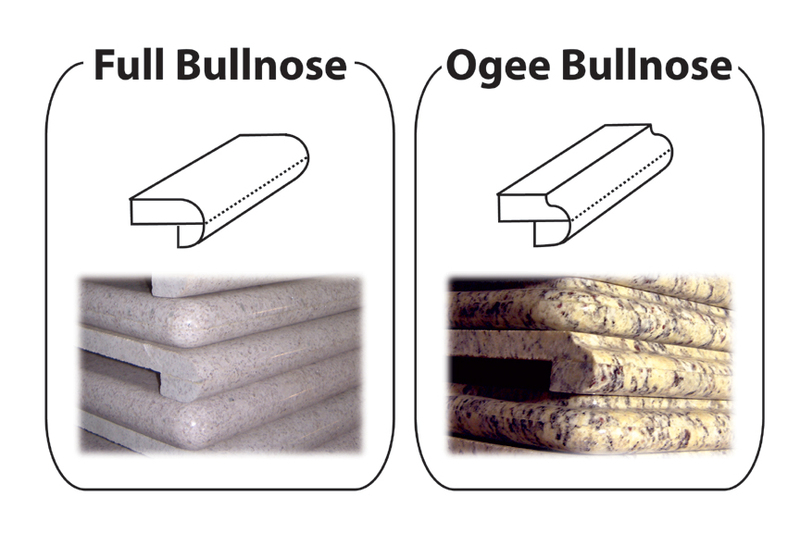 Our material comes in two types of edges, Full bullnose and Ogee bullnose. They also comes in 26" counters, 4" backsplashes, 36", 42", and 52" peninsulas. For traditional slabs, we purchase material from some of our trusted worthy local vendors. A job typically cost 30%-50% more, and takes about a week from measurement to installation. However, clients will have hundreds of color choices, about five different finishes, and fifteen edge options. Due to the bigger sizes, raw slabs can offer more freedom for the designer and the fabricator as well.